Augustus Saint-Gaudens (/əˈɡʌstəs ˌseɪntˈɡɔːdənz/; March 1, 1848 – August 3, 1907) was an American sculptor of the Beaux-Arts generation who most embodied the ideals of the "American Renaissance". 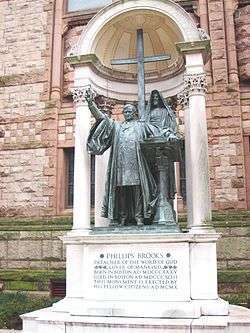 Raised in New York City, he traveled to Europe for further training and artistic study, and then returned to New York, where he achieved major critical success for his monuments commemorating heroes of the American Civil War, many of which still stand. In addition to his works such as the Robert Gould Shaw Memorial on Boston Common, and the outstanding grand equestrian monuments to Civil War Generals, John A. Logan in Chicago's Grant Park, and William Tecumseh Sherman, at the corner of New York's Central Park, Saint-Gaudens also created such works the Diana and employed his skills in numismatics. He designed the $20 "double eagle" gold piece, for the US Mint in 1905–1907, considered one of the most beautiful American coins ever issued as well as the $10 "Indian Head" gold eagle, both of which were minted from 1907 until 1933. In his later years he founded the "Cornish Colony", an artistic colony that included notable painters, sculptors, writers, and architects. 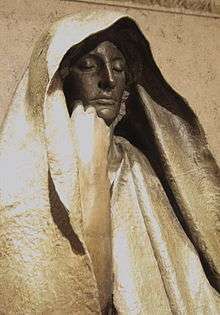 His brother Louis Saint-Gaudens was also a well-known sculptor with whom he occasionally collaborated. 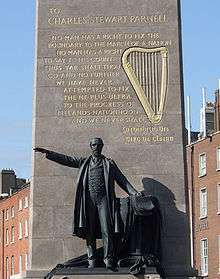 Born in Dublin to a French father and an Irish mother, Saint-Gaudens was raised in New York, after his parents immigrated to America when he was six months of age. In 1861, he became an apprentice to a cameo-cutter, Louis Avet, and took evening art classes at the Cooper Union. Two years later, he was hired as an apprentace of Jules Le Brethon, another cameo cutter, and enrolled at the National Academy of Design. At age 19, his apprenticeship completed and he traveled to Paris in 1867, where he studied in the atelier of François Jouffroy at the École des Beaux-Arts. In 1874, Edwards Pierrepont, a prominent New York reformer, hired Saint-Gaudens to create a marble bust of himself. Pierrepont, a phrenologist, proved to be a demanding client insisting that Saint-Gaudens make his head larger. Saint-Gaudens said that Pierrepont's bust "seemed to be affected with some dreadful swelling disease" and he later told a friend that he would "give anything to get hold of that bust and smash it to atoms." 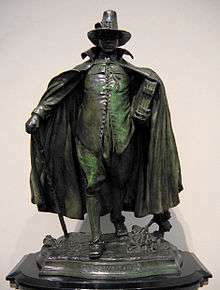 In 1876, he won a commission for a bronze David Farragut Memorial. He rented a studio at 49 rue Notre Dame des Champs. Stanford White designed the pedestal. It was unveiled on May 25, 1881, in Madison Square Park. 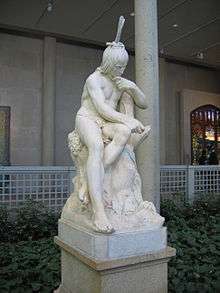 He collaborated with Stanford White again in 1892-94 when he created Diana as a weather vane for the second Madison Square Garden building in New York City; a second version used is now in the collection of the Philadelphia Museum of Art, with several reduced versions in museums including the Metropolitan Museum of Art in New York City. The statue stood on a 300-foot-high tower, making Diana the highest point in the city. It was also the first statue in that part of Manhattan to be lit at night by electricity. The statue and its tower was a landmark until 1925 when the building was demolished. The commissions followed fast, including the colossal Standing Lincoln in Lincoln Park, Chicago in a setting by architect White, 1884–1887, considered the finest portrait statue in the United States (a replica was placed at Lincoln's tomb in Springfield, Illinois, and another stands in London, facing Parliament Square), and a long series of memorials, funerary monuments and busts, including the Adams Memorial, the Peter Cooper Monument, and the John A. Logan Monument. 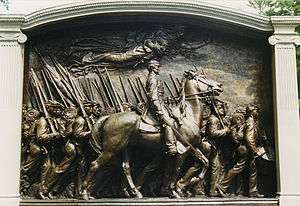 Arguably the greatest of these monuments is the bronze bas-relief that forms the Robert Gould Shaw Memorial on Boston Common, 1884–1897, which Saint-Gaudens labored on for 14 years; even after the public version had been unveiled, he continued with further versions. Two grand equestrian monuments to Civil War generals are outstanding: to General John A. Logan, atop a tumulus in Chicago, 1894–1897, and to William Tecumseh Sherman at the corner of Central Park in New York, 1892–1903, the first use of Robert Treat Paine's pointing device for the accurate mechanical enlargement of sculpture models. 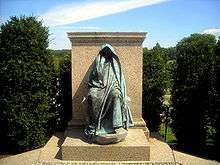 The depictions of the African-American soldiers on the Shaw memorial is noted as a rare example of true-to-life, non-derogatory, depictions of Afro-ancestral physical characteristics in 19th Century American art. 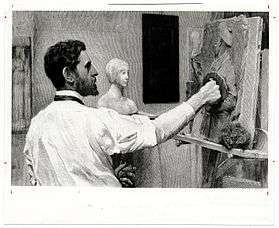 Portrait of Augustus Saint-Gaudens by Kenyon Cox. ↑ "Saint Gaudens National Historic Site". National Park Service. Retrieved December 14, 2013. ↑ "Saint-Gaudens National Historic Site". Retrieved 23 June 2013. ↑ David McCullough (Fall 2011). "Adventures in Paris". American Heritage. 61 (2). p. 40. ↑ David McCullough (Fall 2011). "Adventures in Paris". American Heritage. 61 (2). p. 41. ↑ Supple, Carrie F. and Walton, Cynthia, pubs. The Nichols Family Papers 1860–1960. 2007, Manuscript Collection No. 1. 1 2 3 "Judge Edwards Pierrepont". Smithsonian American Art Museum and the Renwick Gallery. Retrieved 2016-02-25. ↑ David McCullough (Fall 2011). "Adventures in Paris". American Heritage. 61 (2). p. 44. ↑ David McCullough (Fall 2011). "Adventures in Paris". American Heritage. 61 (2). p. 48. ↑ "Diana". Philadelphia Museum of Art. Retrieved 10 August 2012. ↑ "Augustus Saint-Gaudens' Memorial to Robert Gould Shaw and the Massachusetts Fifty-fourth Regiment". National Gallery of Art, Washington, DC. 1997. ↑ US 1909.com Saint-Gaudens Archived July 17, 2011, at the Wayback Machine. ↑ "Augustus Saint-Gaudens". Fine Art May 2007,2009. Rago Arts and Auction Center. ↑ Dryfhout, John (1982). 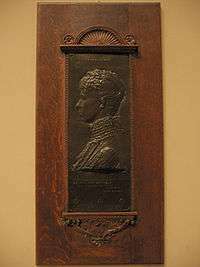 The work of Augustus Saint-Gaudens. Lebanon, NH: University Press of New England. pp. 246–247. ↑ Jerome Connor Sculptor – Annascaul Village, Annascaul Accommodation, Tom Crean, Jerome Conor, Irish Horse Fair and more!. Annascaul.net (2011-05-20). Retrieved on 2013-08-21. ↑ List primarily gleaned from Wilkinson, Burke, Uncommon Clay: The Life and Works of Augustus Saint Gaudens, photographs by David Finn, Harcourt Brace Jovanovitch, Publishers, San Diego, 1983. ↑ "United States, $20, 1907". National Museum of American History, Smithsonian Institution. Retrieved 2008-06-16. ↑ 2009 Ultra High Relief Double Eagle. 2009 Ultra High Relief Double Eagle. Retrieved on 2013-08-21.